Kid-friendly vegetarian recipes are hard to come by. To expand your horizons you might want to try other cuisines for vegetarian options. Today’s post is a easy to make vegetarian recipe that uses cream of wheat and vegetables. It feels funny to try write a tutorial for this because it is such a staple in my home country. It is like writing a recipe for making toast! However outside of our cuisine, not many people know about this recipe. Getting kids to eat healthy is a challenge these days. Processed foods have made it to every home and sure enough you cannot eliminate it from your diet completely. And truthfully if you have a picky eater on your hand then it changes that equation in a heart beat. I cook for my family everyday and try to use fresh and wholesome ingredients whenever possible. 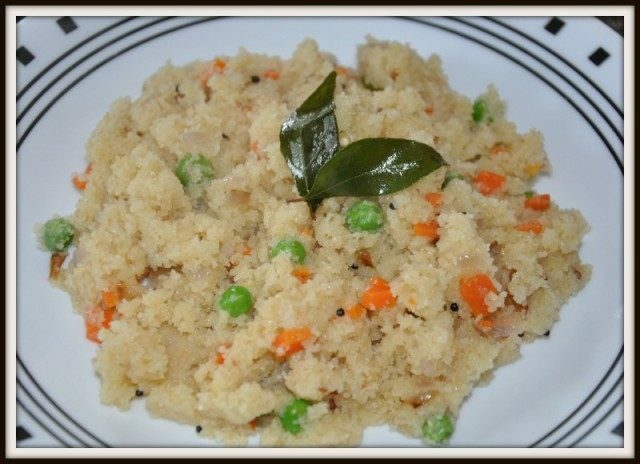 “Upma” /Cream of What stir fry is one such recipe, If you are not familiar with cream of wheat, do give it a try. It is very similar in texture to couscous but cooked in a slightly different way, almost like cooking polenta. Take oil in a pan. Add mustard seeds, allow them to splutter. Add onions, ginger, carrots and peas and sauté till onions are translucent. Add 1 1/2 cups of water, 1 tsp salt and bring it to a rolling boil. Reduce the heat to medium-low and add the cream of wheat slowly, a little at a time and keep stirring to avoid lumps. Just like you would cook polenta. The cream of wheat will absorb all the liquid and swell. Cook for another 5 minutes approx. Once all the liquid is absorbed and the cream of wheat easily pulls away from the pan you are done. Drizzle a little ghee for added flavor. The ratio of cream of wheat to water is 1 : 1 1/2. For every cup of cream of wheat it is 1 1/2 cups of water. You can adjust the other ingredients to your preferences. If you would like the dish to be flaky keep the proportions. If you rather have it moist add another 1/2 cup of water taking take care to never go beyond a 1:2 ratio. Any thing higher makes the dish very soggy.